Enjoy staying only minutes from well known attractions, beaches and more! Buyer may receive a title fee credit, inquire for details! 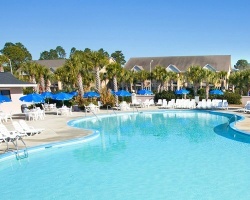 Located three miles south of Myrtle Beach, *Plantation Resort Villas* is tucked within Deerfield Plantation, located only a mile from the beautiful Atlantic Ocean beaches! Golf tee times at more than 100 area courses are available and should be arranged in advance. Enjoy the health and swim club, which offers a heated, indoor pool, certified aerobics, an exercise room, weight room, outdoor pool, sun deck, whirlpool, saunas and steam rooms. A snack bar is located nearby. Don't miss the many music theaters, Broadway at the Beach, Fantasy Harbour, or Barefoot Landing for year-round activity. For more information, visit www.plantationresort.com. *RCI Gold Crown Rated* Featuring a finely appointed 2 bedroom, 2 bath villa that will accommodate 6 guests comfortably. Usage is annual in a floating week. For more information or to make an offer, please submit the inquiry form.